were highly correlated with carotenoid content. focus on process rather than outcome. conferring a pink-purple color to them at least seasonally. sampling and analysis program using sterile 0.5 L bottles. mg on a Denver Instruments A-160 electro-balance. Drier. The resulting purple powder was stored at −4˚C. (0.2 µm) and cleaned by solid phase extraction (SPE). noids yielded an orange-red color in the column packing. hexane layer. The n-hexane fraction was dried in vacuo. The final step was chromatography over silica, as above. layer was extracted twice more with portions of hexane. same stationary phase at a flow rate of 1.0 ml/min. filters. Typical filtered volumes were 2 - 4 ml/sample. at 780 nm for the same extracted samples. waste lagoon sample in a clear polystyrene Petri plate. 100282. For information on HSV see: http://en.wikipedia. of Brand-Williams et al. with some modifications. taken using a spectrophotometer each minute for 6 min. sponded with the antioxidant power of the carotenoid. 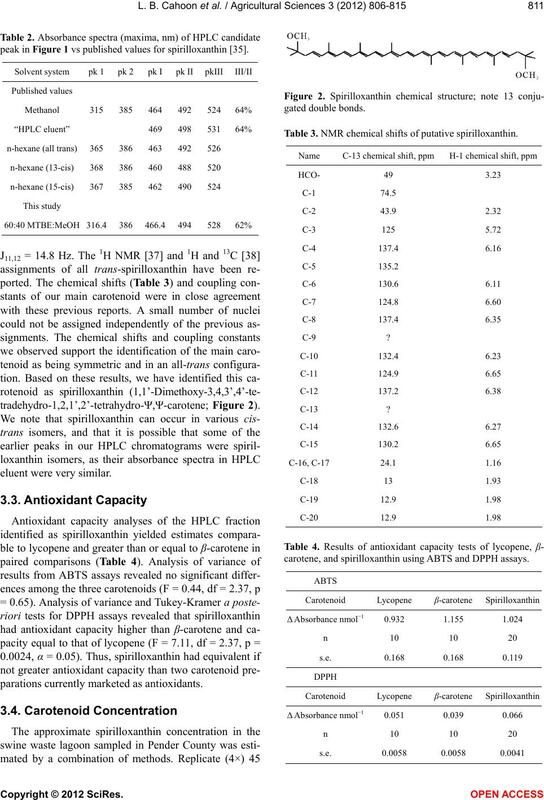 values corresponding to greater antioxidant capacity. by the donation of hydrogen ions from the carotenoid. 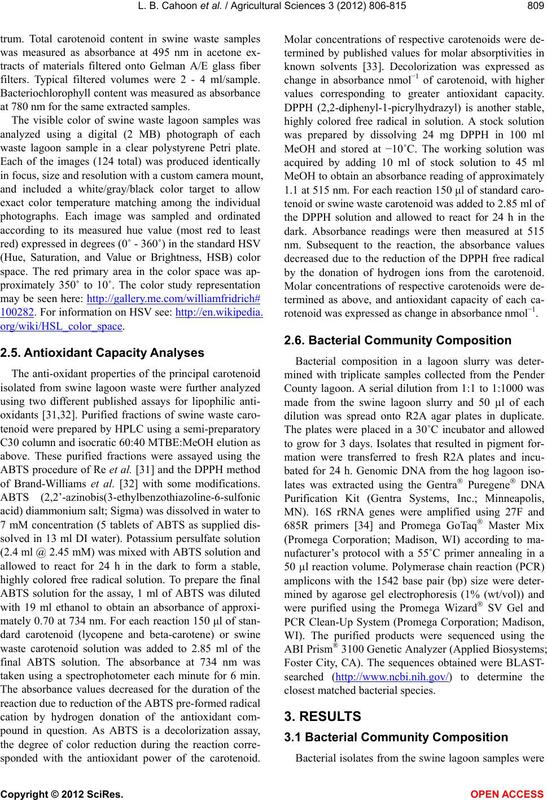 rotenoid was expressed as change in absorbance nmol−1. dilution was spread onto R2A agar plates in duplicate. nomic identification based on 16S rRNA gene sequences. HL 10 White Nocardiopsis sp. HL 13 Orange Deinococcus sp. ues for spirilloxanthin (Figure 1, Table 2). but were not further characterized. main features of the relevant portion of the spectrum. peak in Figure 1 vs published values for spirilloxanthin . parations currently marketed as antioxidants. Table 3. 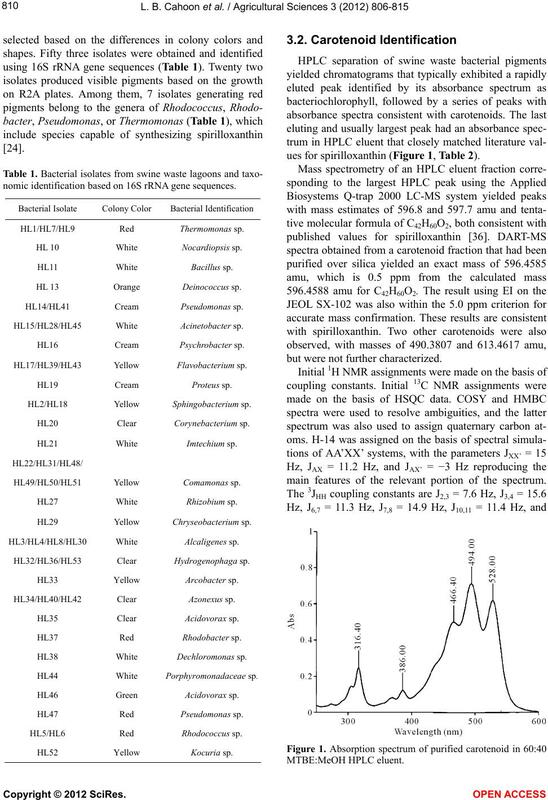 NMR chemical shifts of putative spirilloxanthin. carotene, and spirilloxanthin using ABTS and DPPH assays. 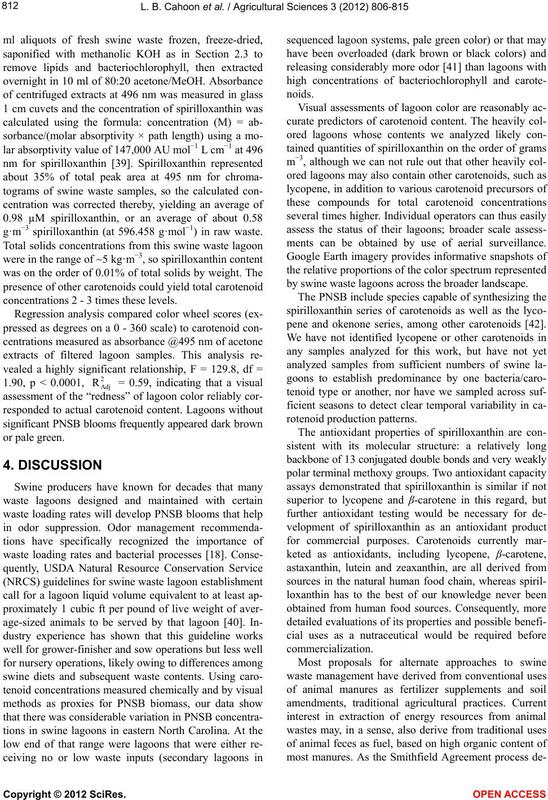 g·m−3 spirilloxanthin (at 596.458 g·mol−1) in raw waste. concentrations 2 - 3 times these levels. ments can be obtained by use of aerial surveillance. 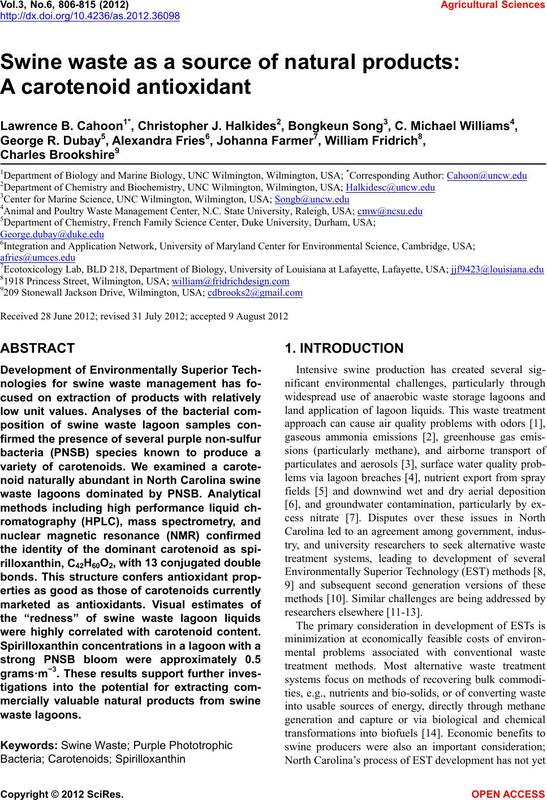 by swine waste lagoons across the broader landscape. pene and okenone series, among other carotenoids . costs to markets at any distance would be considerable. 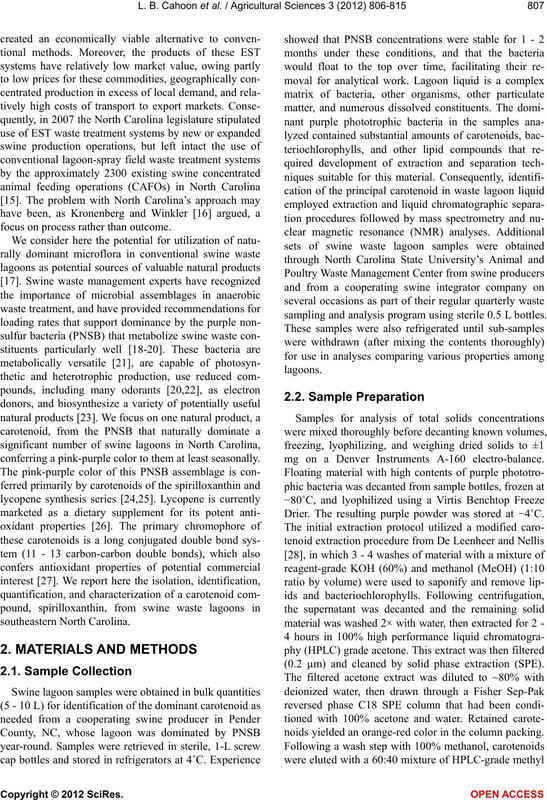 while performing waste treatment functions adequately. research is needed to address these questions. Szogi, A.A., Vanotti, M.B. and Stansbery, A.E. (2006). Novak, J.M., Watts, D.W., Hunt, P.G. and Stone, K.C. after a decade of intensive swine manure application. 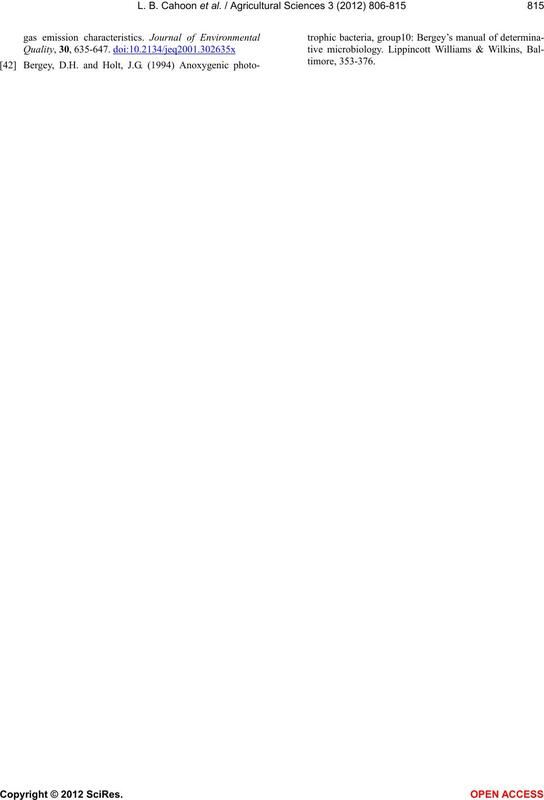 Journal of Environmental Quality, 29, 1310-1315. 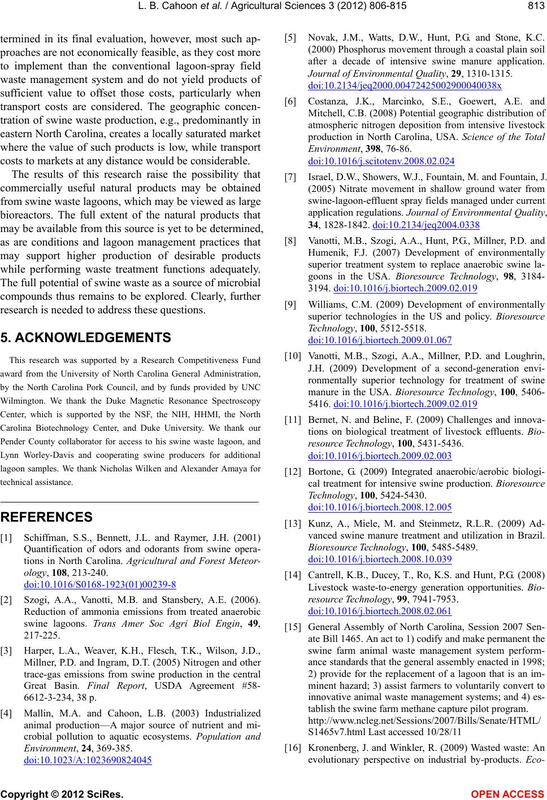 Israel, D.W., Showers, W.J., Fountain, M. and Fountain, J.
vanced swine manure treatment and utilization in Brazil. tablish the swine farm methane capture pilot program. ponds. Biotechnology Letters, 26, 819-822. Do, Y., Schmidt, T., Zahn, J., Boyd, E., de la Mora, A.
 Larson, R.A. (1997) Naturally occurring antioxidants. Lewis Publishers, New York, 195 p.
tion spectroscopy of geometric isomers of carotenoids. assay. Free Radical Biology & Medicine, 26, 1231-1237. Use of free radical method to evaluate antioxidant activity. derivatives. 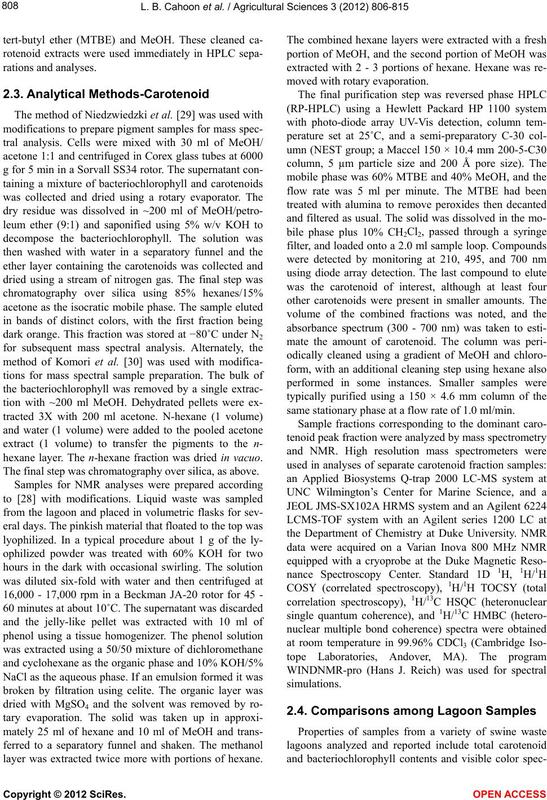 Organic Mass Spectrometry, 28, 785-788.
rotenoids 56. On the spirilloxanthin stereoisomeric set. Acta Chemica Scandinavica, 51, 1128-1131.
and Computer Sciences, 42, 1311-1319.
spectral properties. 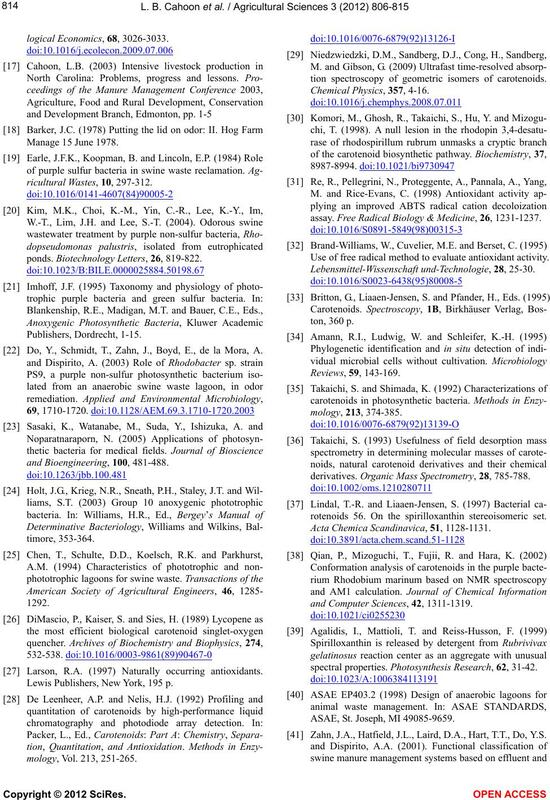 Photosynthesis Research, 62, 31-42. ASAE, St. Joseph, MI 49085-9659. Zahn, J.A., Hatfield, J.L., Laird, D.A., Hart, T.T., Do, Y.S.